One of the many Apple fans from Sweden sent an email to Steve Jobs this week, asking about whether or not iPad will be able to tether with the iPhone? The full email which was sent is as follows. Will the wifi-only version somehow support tethering thru my iPhone? Two devices, based on the same OS, with already built-in technology to share one data plan suggests a secondary contract could possibly be redundant. From the look of your keynote, where the iPad sits well between my MacBook Pro and my iPhone, I was hoping the three of them could interact as seamless as possible. Jobs’, in his usual style replied to the email, saying.. So that pretty much settles this issue. 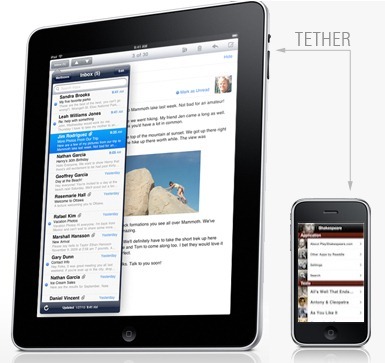 iPad will NOT be able to tether with the iPhone. iPad vs HP Slate – Where Do You Stand in this Mac vs PC War? Microsoft Courier Pops Up the Day iPad Release Dates are Announced. Surprised?